The Jurassic period was a period of the Mesozoic era, spanning the time between the Triassic and the Cretaceous periods, about 206 to 144 million years ago. The start of the period is marked by the major Triassic-Jurassic mass extinction. Named for the Jura Mountains on the border between France and Switzerland, where rocks of this age were first studied, the Jurassic became a household word with the success of the movie Jurassic Park – although most of the dinosaurs featured in the film actually lived during the Cretaceous! The Jurassic was the beginning of the age when reptiles dominated the land, sea, and air. During this period, vegetation was greener and more lush. By the late Jurassic, great dinosaurs such as Brachiosaurus, Allosaurus, Ceratosaurus, and Stegosaurus, had evolved on land. 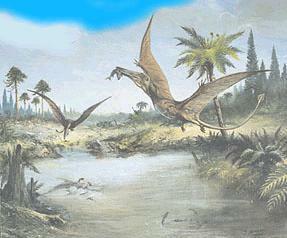 Pterosaurs ruled the skies and the earliest known birds appeared. The Jurassic period also saw the breakup of the super-continent Pangea, which began in the Triassic, continue.